full advantage of everyone’s end of winter restlessness! It’s finally here! 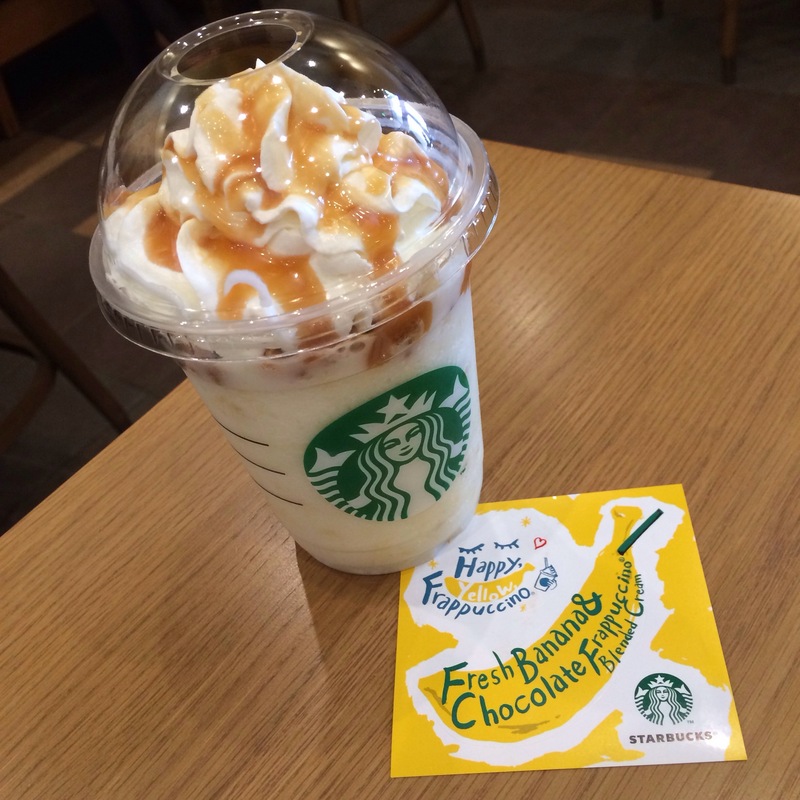 The Happy Yellow Frappuccino is finally in stores. But wait, didn’t the Creamy Vanilla with Lemony Swirl just get here a couple weeks ago? And the Sakura Frappuccino just before that? Yes, Starbucks seems to have really ramped up their production cycle in the past few months, with each drink lasting less than a month and selling out before its allotted time is even up. Filling in the gaps with the Coffee and Cream line (should I write up a review for that one? 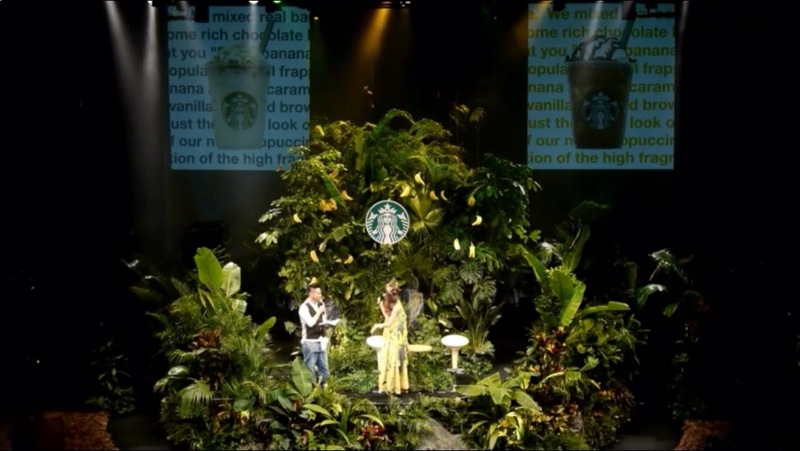 It’s rather self-explanatory…) they’ve managed to create quite an artificial scarcity, whipping the audience up and encouraging them to go out and grab this drink before it goes away. Japan is incredibly adept at the seasonal food market, which is buoyed by the added pressures of artificial scarcity. After all, if something is seasonal then it inherently can’t last forever. While you may hope to catch it again next year, there’s no guarantee that you’ll ever see a product more than once. Get it now, or forever hold your peace! 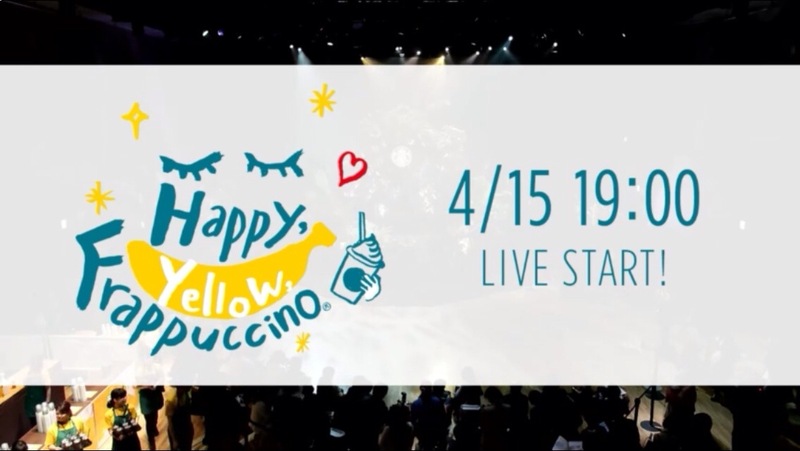 Another way that Starbucks Japan has whipped up excitement for the Happy Yellow Frappuccino is with an aggressive social media campaign that has ranged across platforms and (literal) stages. Well-designed and thought out, the Banana drink has been visually arresting and strongly branded even before being tasted by a single customer. 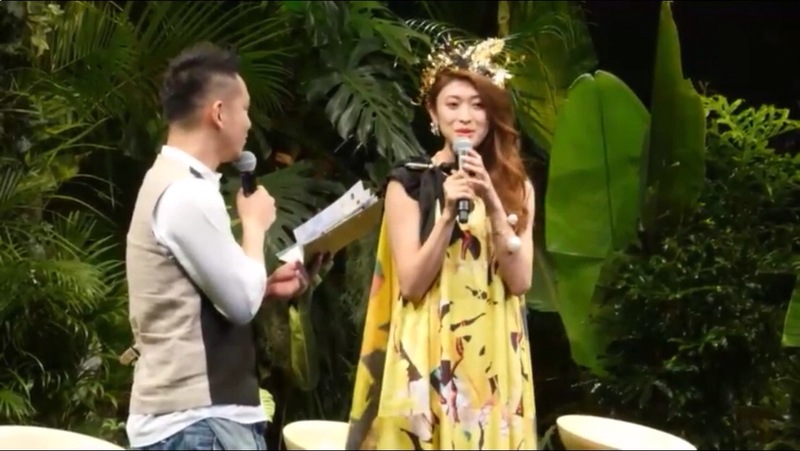 An event hall in Ebisu was decorated with jungle leaves and bananas, and model Yu Yamada (she’s from Okinawa, to encourage that tropical feel) was trotted out in her high-fashion banana sarong. There was even a little fashion show, and while it may sound silly (the models had yellow eyebrows! Yu had a golden crown of banana leaves!) it actually looked pretty fun. And there were obviously trays and trays of fresh banana Frappuccinos being passed around at the event, so who wouldn’t want to join in? Another way that the visual branding has been reinforced has been on Twitter and Instagram. The number of photos I’ve seen that all look strikingly similar is almost spooky. The best example is from the sampling that took place shortly before the drink was officially released. About every hour or so the blenders would whirl and a barista would come around with a tray of tiny Frappuccinos and, more importantly, a stack of colorful stickers. Pictures of these adorable little sips with their nicely designed & well-branded stickers popped up all over the internet, both informing others and giving the photo-taker bragging rights—look what I got! The photo practically composes itself, and is just begging to be posted on your social media platform of choice. It seems to be working, as the local Starbucks was packed yesterday, with a line wrapping around the store as the barristas in their new yellow t-shirts kept the blenders buzzing. Most interesting was that the store had a distinct Saturday atmosphere, filled with gaggles of girls enjoying their drinks together, and of course taking pictures of their Frappuccinos to share online. I don’t usually see many groups of young women in the store on a Wednesday, but their presence really underlines the success of the social aspect of this campaign. There are two flavors available, the Fresh Banana Chocolate Cream and the Fresh Banana Caramel Cream. Both drink like a meal, packing a wallop of cream and banana and brownie chunks. The brownie chunks hiding under the whipped cream are the true star of the drink for me, and the caramel blondie bits are especially delicious. A special wide straw is necessary because this business is chewy, but if I’m paying that much for a drink, I’m glad that basically includes a snack! Overall I think the chocolate is the stronger of the two, and the ones I’ve tried have had slightly green banana tastes to them. I hope they let the bananas ripen a bit more, but I’m still much happier than I thought I would be when I first heard that banana was coming out. I was expecting artificial flavorings, and this definitely does not taste like a big cup of laffy taffy. So, what do you think? 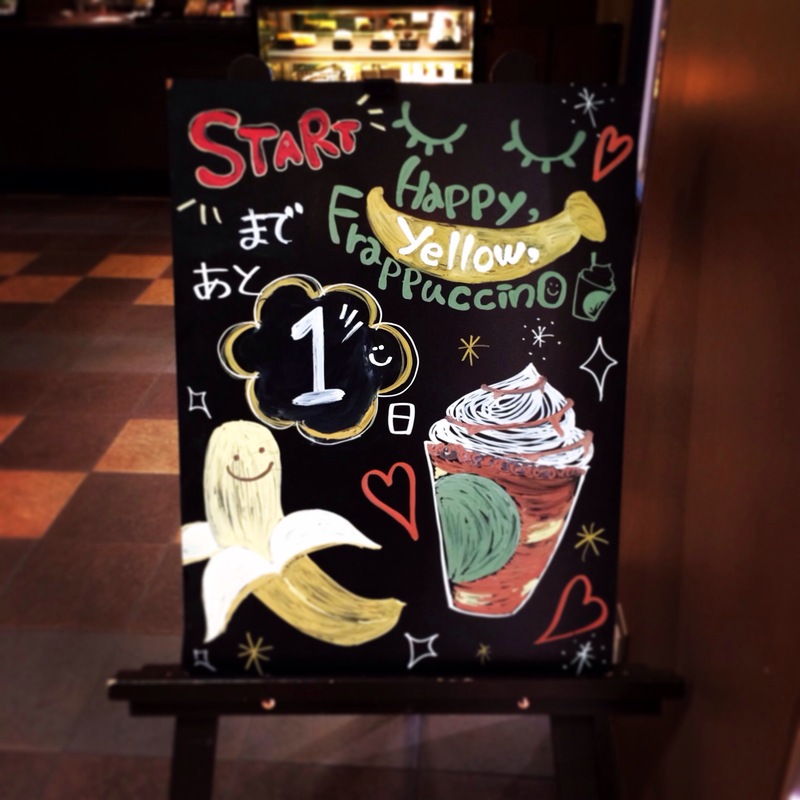 Do you want a Happy Yellow Frappuccino? Is it overpriced, or worth it for the experience? Do you want to share one with your friends and post pictures on any and all social media platforms? Did you attend the Youtube livestream, or would you have if you’d known about it? Let me know in the comments, and don’t forget to tell your Starbucks lovin’, social media interested friends about this newest star in the Starbucks constellation! 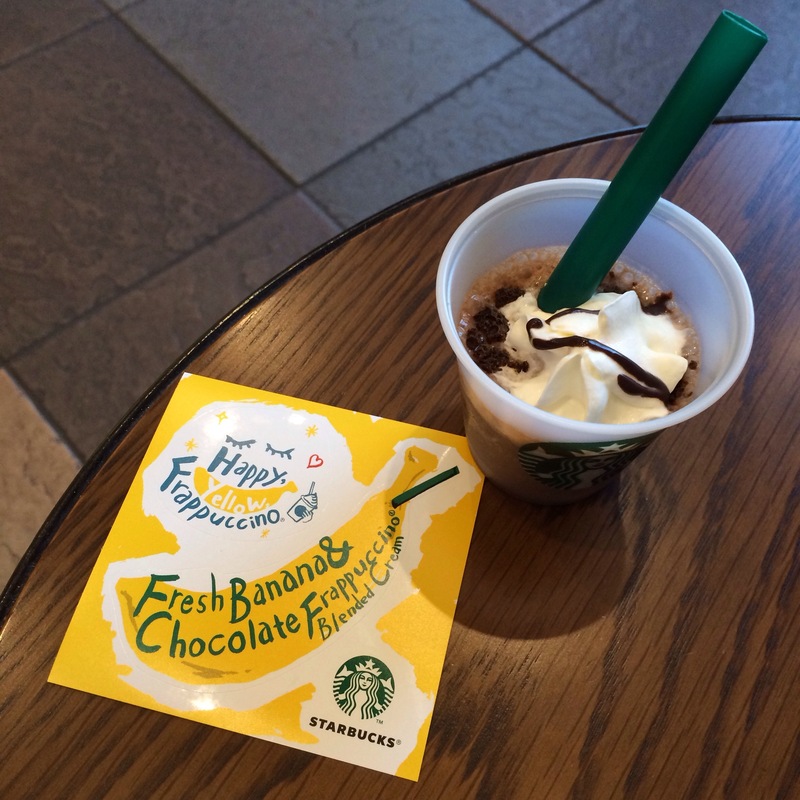 This entry was posted in Food!, Japan, Starbucks and tagged banana, brand, branding, brownie, caramel, chocolate, cream, delicious, dessert, frappachino, frappuccino, frappucino, frapuccino, frapucino, happy, Japanese, marketing, sbux, social media, Starbucks, sweet, tasty, yamada yu, yellow, yu yamada. Bookmark the permalink. Another delicious review! I would love a taste not sure about the brownie chunks though. I guess if I thought of it as a brownie sundae I could warm up to the idea. Thanks Alice! I really enjoyed both flavors, and I must say I was most impressed at the speed the barista was working at last night. 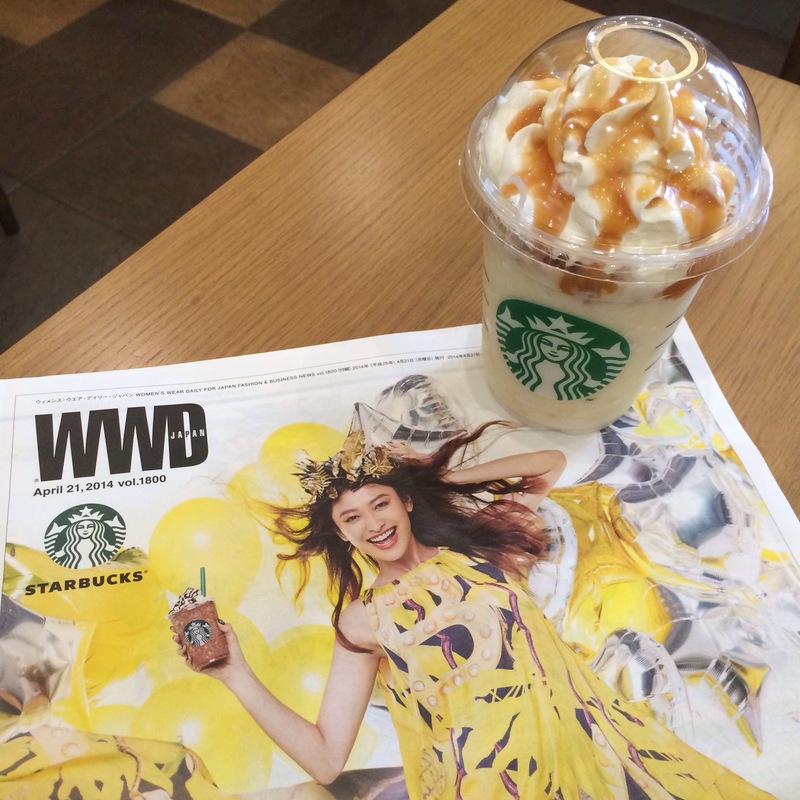 She had Happy Yellow Frappuccino production down to a well oiled art. As far as seasonal productions go, it is very interesting how that has altered my own habits. Knowing that something I like will be gone in a week has definitely lead me to purchase things I may not have otherwise. This has been especially true at McDonald’s, but also at Starbucks and even drinks and chips at the convenience store. I am still sad that they have never brought back mozzarella and tomato potato chips.